Lake Kizaki is a small lake of about 140 ha with a maximum length of 2.7 km and a maximum width of 1.2 km. In Lake Kizaki, the first sounding was carried out in 1907, but unfortunately no definite station as a base for limnological studies was established, except from 1921 to 1939, when the Fishery Experimental Station provided facilities for limnological research. This is why there are no continuous data of basic limnological interest, especially records of the flora and fauna of Lake Kizaki and the two other Nishina Lakes, Aoki and Nakatsuna, which are connected in the same water system. 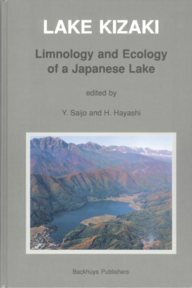 Although Lake Kizaki is located at the foot of the Japanese Northern Alps and the altitude of its surface is 764 m, a distinct thermal stratification with a temperature difference between layers of about 15 °C forms in summer. The water temperature near the bottom is 5 to 7 °C throughout the year. Due to this thermal condition, an oxygen deficiency prevails near the lake bottom from summer to autumn until overturn. Associated with the seasonal succession of water temperature and the vertical distribution of oxic and anoxic conditions, dynamic changes in chemical conditions and related microbial activity have long been observed in this lake. Furthermore, the lake is of a convenient size for extensive studies, so that it is easy to follow changes in the lake even daily or at one meter depth intervals. Lake Kizaki is thus an ideal field location, which explains why so many biogeochemical and microbial studies have been made on this lake. References - Subject index - Taxonomic index.